Editor: De La Torre, Miguel A. Titles provides historic contexts for the many religious identities expressed among Hispanic Americans. Covers historical development, current practices, and key individuals, while additional essays look at issues across various traditions. 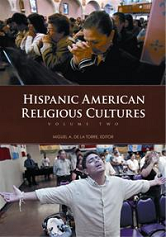 By examining the distinctive Hispanic interpretations of religious traditions, Hispanic American Religious Cultures explores the history of Latino and Latina Americans and the impact of living in the United States on their culture.